The Brownsville Police Department arrested a 19-year-old man Monday and accuse him of attempting to take a police officer’s weapon. Police Spokeswoman Melissa Gonzalez said officers investigating a robbery and burglary late Monday morning tried to arrest Miguel Angel Cardenas believing he was involved in the incidents when a scuffle broke out and Cardenas attempted to grab an officer’s weapon. 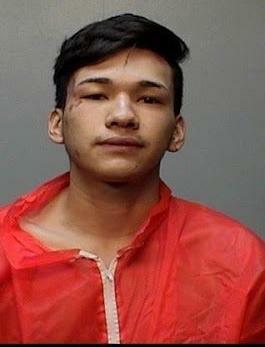 Gonzalez said before encountering Cardenas, police responded to a robbery call at 10:50 a.m. on the 1000 block of East Jefferson after a woman told them a man trying to sell her assorted jewelry knocked her to the ground and stole her laptop computer and other electronics. While authorities are taking down the woman’s information and detaining Cardenas, who they spotted in the area while investigating, police receive a call from the 900 block of East 10th Street for a burglary of a habitation, Gonzalez said. Cardenas is charged with attempting to take a weapon from a peace officer, robbery, burglary of a habitation, assault of a peace officer, assault and resisting arrest. He received $59,000 in bonds for the charges, but it wasn’t immediately clear whether he bailed out of jail. “Anytime that people see something suspicious, don’t hesitate to report it to the police and we’ll go out there and investigate,” Gonzalez said.